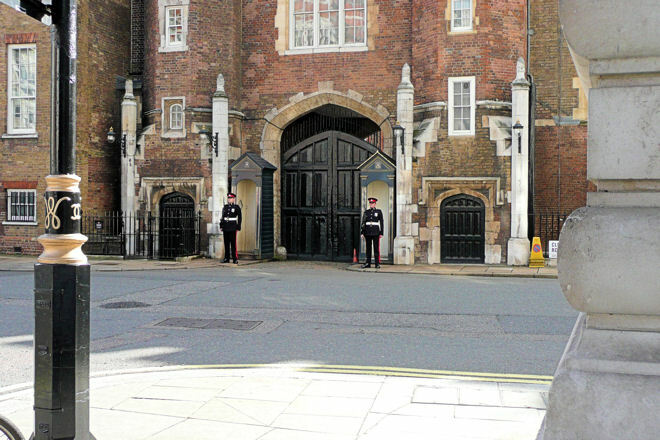 Original sixteenth centry entrance to St James's Palace from St James's Street. Opening Hours: The Palace is not open to the public. The Queen's Chapel and Chapel Royal remain active places of worship and open to the public at selected times. Facilities: see St Jamses' Park. St. James's Palace, built by Henry VIII in the early 1530’s, is one of London's oldest palaces where Kings and Queens of England resided for over 300 years. Although the reigning monarch now live at Buckingham Palace, it still remains the Official Residence of the Sovereign and, as the most senior royal palace in the UK, it is named the Royal Court, the ‘Court of St James's’. Today St. James's Palace is the London residence of several members of the Royal Family including the Princess Royal (the Queen's daughter) and Princess Alexandra. The palace complex is regularly used for official royal and government functions. St. James's Palace was built in 1536 on the site of a former leper hospital dedicated to Saint James the Less. During the eighteen and nineteenth centuries the Palace ‘complex’ grew to included several new buildings; York House, Lancaster House and Clarence House. 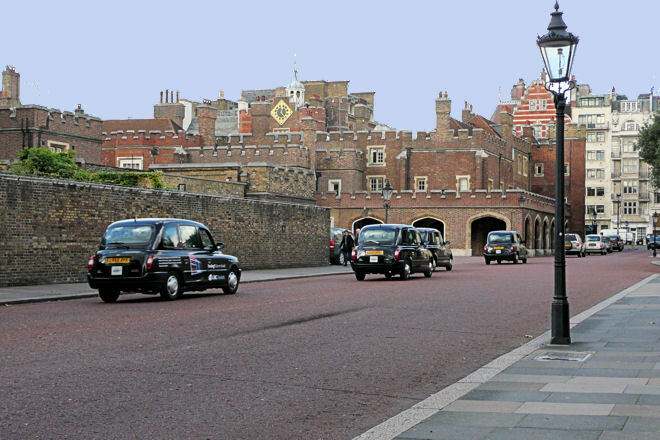 Today, much still survives of the original red-brick Tudor style building including the Chapel Royal and the gatehouse which, flanked by polygonal turrets with mock battlements, is guarded by soldiers from the Queen’s Household Division when the Monarch are in London. St. James's Palace has been the setting for some of the most important events in royal history; Henry VIII's second wife, Anne Boleyn, stayed there the night after her coronation; in 1558 Mary Tudor signed the treaty surrendering Calais back to the French; Elizabeth I was resident during the threat posed by the Spanish Armada and set out from St James's to deliver her famous speech to the troops before they set sail from Tilbury on the river Thames. Charles II, James II, Mary II and Queen Anne were all born and baptised at St James's. Charles I spent his final night sweating in the halls, before being led away for his execution at Banqueting House. William IV (Duke of Clarence) was the last Sovereign to use St. James's Palace as a residence. Queen Victoria married Prince Albert in the Chapel Royal in 1840, and court levées (formal receptions) continued to be held at St. James's Palace until 1939. Princess Diana resided there for a while until her divorce in 1996 and her coffin was kept the Chapel Royal before her funeral. 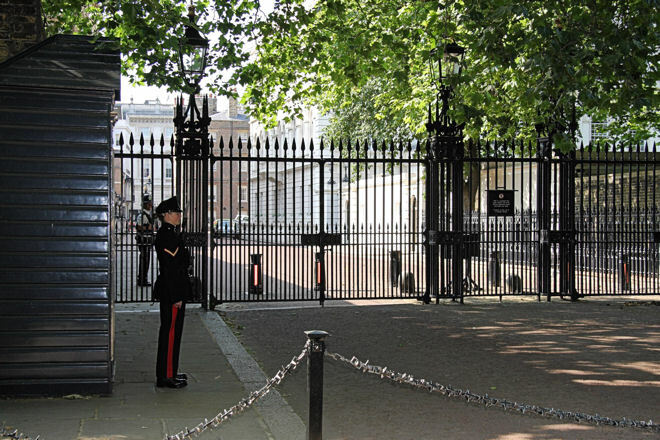 Clarence House, the former London home of the late Queen Elizabeth, The Queen Mother, is within the environs of St. James's Palace and today provides the official London residence for The Prince of Wales, The Duchess of Cornwall and Prince Harry.